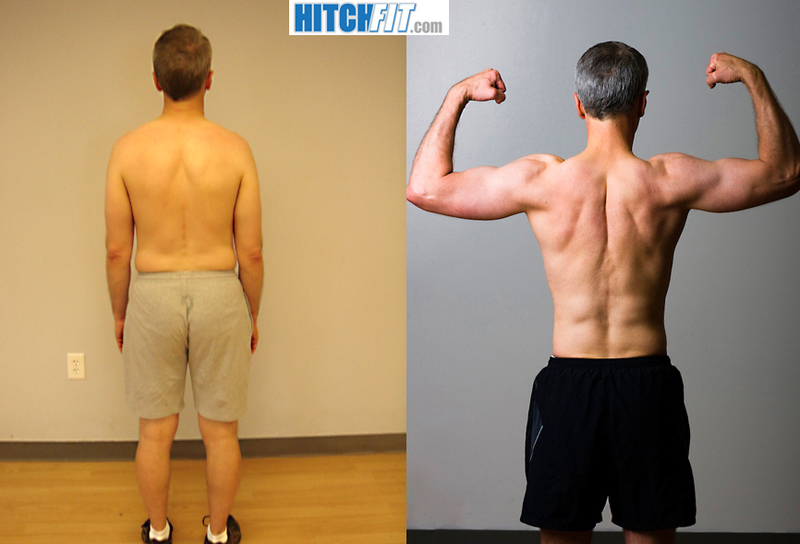 Kansas City Personal Training Client Gets Lean at Hitch Fit Gym! 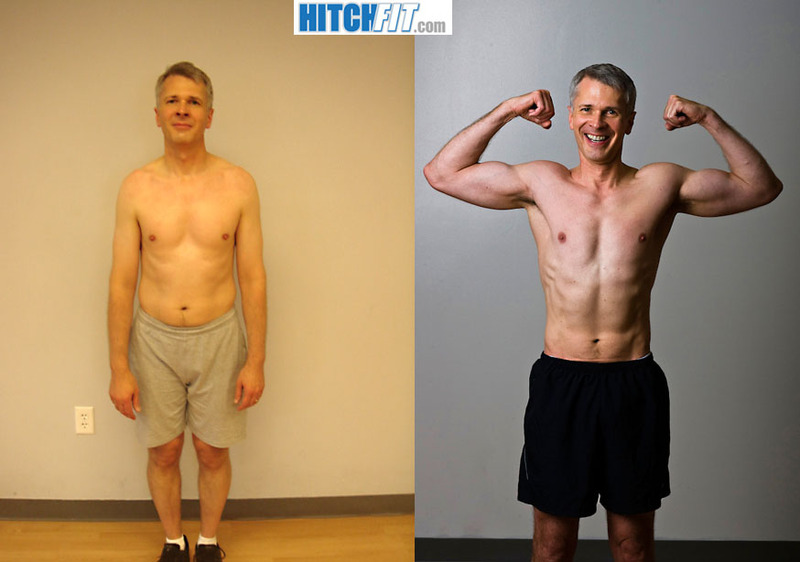 Home/Success Stories/Kansas City Personal Training Client Gets Lean at Hitch Fit Gym! I am excited to share with you my latest Transformation Doug. This 47 year old came to me needing some guidence about his nutrition and fitness. What i wanted to teach him was a lifestyle. I cannot tell you how impressed i was week in week out by the disipline and hard work doug put in. He started at 18.1% and in 12 wees went to a amazing 9.76% bodyfat. To those of you out there making the excuse that age is why you will never get fit again, think again. Did i mention he is nearing 50 years old and in the best shape of his life.. AMAZING..
Congrats to you again Doug, you will inspire so many out there, thank you for sharing your story with us. if a picture could tell a tale look at his body posture and face in his before picture compared to his confident, fit and happy nature in his after.. its worth every sacrifice and hard workout…. When my friend Brent completed his training with Micah and told me that it had changed his life, I didn’t understand what he meant. Now that I have completed my 12 weeks with Micah, I completely understand what he meant! I moved from the classroom to an office job nearly 2.5 years ago, and during that time I gained 16 pounds. I had almost become resigned to the weight gain; I began thinking it was due to getting older. But the success that Brent experienced motivated me to give Micah a try. That was one of the best decisions I have ever made. The first thing we did was take my measurements and take the “before” pictures. That was an eye opening experience! Although I knew that I had gained weight, I didn’t realize the degree to which I was out of shape. You might ask how that is possible after looking at my “before” pictures, but I guess over time the change was gradual enough that looking at myself in the mirror every day desensitized me to the change that was occurring. When Micah calculated my body fat at 19% (ouch!) and said I could get it to 10% if I worked really hard, I had my doubts – I am out of town Monday through Friday for work and could be in KC to train only on the weekends – but I was willing to give it a try. Thanks to Micah’s coaching, I did it. Micah coached me not only physically, but also on my diet, and on my attitude. I can say, without hesitation, it wouldn’t have happened without him. I was a bit nervous on my first day of training: I’d heard about the about the consequences of that first intense workout, but I had a great first experience. Although exhausted—and two days later sore as heck—I left that first session knowing I was going to be able to do it. There really were two reasons for my success. First, Micah made me realize it is all about choices. I can choose to eat better, or not. I can choose to challenge myself physically, or not. Second, Micah is a genuine, great guy: He has such a positive attitude, he loves what he does, and it shows. You can’t train with Micah and not leave feeling better about yourself! You quickly realize how important choices are. Anyone can do this, BUT you have to be ready to make the choice to commit to a lifestyle change…to make different choices about exercise and diet. I really was shocked by the importance of my food choices. I changed my diet before I started training with Micah, and I lost 6 pounds even before I started training! Twelve weeks later, while I was pleased I continued to lose some of that excess weight, I was more pleased with the 9.5% body fat! I look at menus in restaurants totally differently now, and it is not that difficult to do – as long as you’re ready for the commitment. And then there is the attitude change. Micah has the ability to bring out the best in people. He challenges you while he encourages you. He is constantly smiling, because I think he gets as much pleasure out of his clients’ success as we do! 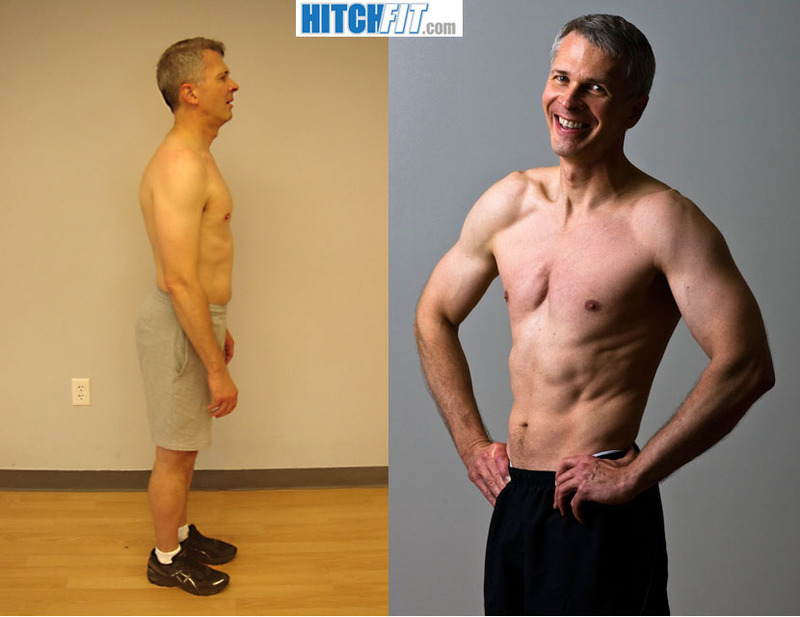 After 12 weeks of training with Micah, we looked at my “before” pictures: Micah wanted to show me not only the physical change that I was able to accomplish, but he wanted me to see my change in attitude—which is obvious in the nonverbal body language! The defeat I was feeling is obvious in the before pics. So now I understand why Brent told me that Micah had changed his life; he changed mine. When you’re ready to commit to looking better and feeling better about yourself (i.e., to get “Hitch Fit”), call Micah. He will change your life.